This 4th of July weekend Debbie and I were fortunate enough to spend the weekend with our dear friends Frank & Joy at a beautiful home in Palm Beach, Florida. This trip was both unexpected and fantastic. From the first day to our last each was filled with great food, spirits, activities, and of course conversation. I did not travel with my camera nor did I expect to blog about this experience. As a result the pictures were all taken on my iPhone and some of the events were not recorded. Oh well… teaches me to be unprepared! Now sit back, grab yourself a Mojito, and enjoy this post for our Palm Beach Weekend. You know you are going to have a great trip when your plane is on time and you make it to the airport early enough to down several cocktails. This trip started in grand fashion with both items proving true for us! Once on the ground we made our way to the amazing house we were staying at this weekend. Joy works for someone who has a winter home in Palm Beach and lets her have access to it during the summer. Lucky for us we got invited to stay here and enjoy this long holiday weekend. Our house for the weekend! Our first dinner out was at Cucina Dell Arte which is Joy’s favorite local spot in Palm Beach. This restaurant was a perfect way to get the weekend started. Beautifully decorated with a broad Italian menu. The food all sounded so delicious it was hard to decide. In addition, I stopped taking pictures after the bread was served. So… all you get for this part of the story is words… oopsie! The bread starter was warm with a perfect crust. The garnish was roasted garlic with olive oil. Fantastic way to start the meal. Our waitress was named Debbie (funny coincidence) and she was terrific. Cute, attentive, and patient, Debbie was the perfect hostess for the evening. First course we shared the Antipasto Misto which was a fantastic mix of cured meats, cheeses, olives, tomatoes, and red peppers. For dinner we shared the catch of the day (yellowtail snapper), Salmon al Fungo, Bolognese Meat ragu with ricotta gnocchi, and my favorite the Ravioli D’aragosta with spiny lobster and mushroom ravioli. The food here is amazing! When in Palm Beach this is a “must do” for you! Ask for Debbie… theirs… not mine! 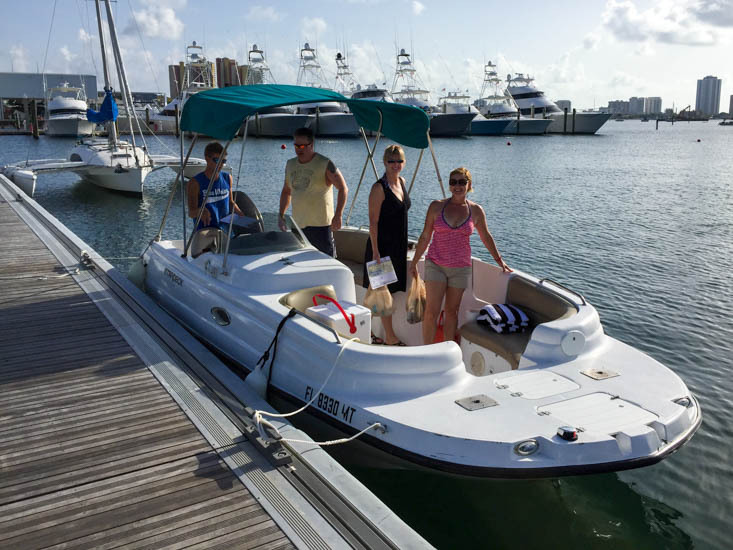 For our first full day at Palm Beach we decided to test our seafaring skills and rent a boat from Bluewater Rentals. We rented a Deck Boat which is a cross between an agile bowrider and a crowd-friendly pontoon boat. It was the perfect choice for the day! This outing needed a cooler full of beer (and possibly water and some snacks). But let’s get back to the beer… this local beer: Invasion Pale Ale was terrific! A local guy from the area suggested this beer the night before when we were getting our provisions (that’s what seafaring folk say, right?!?!). It couldn’t have been a better choice as it was both a full bodied Pale Ale but not too high of an alcohol content. My captain abilities were left unimpaired! This local IPA was excellent! We took the boat north and to the closest ocean inlet. It was a beautiful trip and the water near the inlet was crystal clear allowing us all to see straight to the bottom. Looking around we noticed several boats anchored in and around the inlet allowing their passengers to swim, snorkel, etc. We decided to join them in the fun! After a morning spent boating, swimming, and sampling cold frosty “provisions” we were all hungry and needed a place to stop for lunch. It just so happens a great spot to dock for lunch is the Waterway Café on the Intracoastal Waterway in Palm Beach Gardens, FL. We pulled right up, docked the boat like a boss (well at least after other boaters yelled at us and told us how to do it), and went inside for lunch. Once inside we were greeted by another fantastic server named Jason. He was so much fun and helped us get to food right away. Once again I stopped taking pictures after the first course arrived (oopsies) so you will just have to trust me the lunch was fantastic and we had incredibly fancy drinks with umbrellas in them… below are some of Florida’s finest Conch Fritters! Needless to say we made it back to Bluewater Rentals unscathed and in one piece. We did almost lose the boat (twice), crash in to another boat (only once), and nearly drowned Joy at Peanut Island. But that will be a story for another day. After a day back at the house and a little nap time we got dressed up and made our way down to Clematis Street where all the nightlife is in West Palm Beach. Frank took us to one of his favorite restaurant’s Rocco’s Tacos and we settled in to another evening of good food and frivolity. Rocco’s Tacos has really cool décor and is a vibrant place to dine. Another “must do” when in West Palm Beach. Their table side guacamole is so good we may have ordered two rounds! At this point in the story the theme continues and I stopped taking pictures of the rest of our meal (oopsies!). However, one menu item of note was something Debbie got: a Seafood Molcajete. Essentially this was a fajita bake in a lava bowl served with tortillas, cheese, and sour cream. I found this dish incredibly delicious and different. Will definitely try to make it at home! Clematis Street is a really great hangout spot for locals and visitors alike. They had several blocks closed off with live music and beer tastings. This night was a lot of fun! At one end of the street there was a big field with children’s games and fountains. A terrific family spot in West Palm beach for sure! We even found some really good live music at one of the outdoor bars. This girl (didn’t get her name) could really sing. In addition, please note the drummer’s super small kit! Great bars and live music! I was lucky enough to see all 3 nights of The Grateful Dead’s “Fare Thee Well” shows on Pay Per View. I wish I could have been there in person, but enjoyed the “couch tour” very much! Couch Tour for the Dead 50 show! After a good night’s sleep and a day spent lounging around the pool it was time for some lunch. The for real deal New York Deli is Too Jay’s in Palm Beach! Joy had heard this place was good and she was right. Amazing find right in the heart of Palm Beach! If you like Potato Latke’s, then order them at Too Jay’s! A fantastic way to start the meal (and to end the picture taking… oopsies!). Later that evening we made our way back downtown to the West Palm Beach Waterfront and City Commons and to the 4th on Flagler celebration. The place was packed with hundreds of people vying for their spot to see the fireworks display. We (on the other hand) were well prepared and had tickets to the VIP 4th Club on Flagler. This was the place to be! Outdoor seating right in front of the fireworks! Let me just say the fireworks were amazing. I do not think I have ever seen a display as powerful or beautiful as this one. The 18-minute fireworks extravaganza over Lake Worth Lagoon/Intracoastal Waterway was spectacular! We were so close the ash was falling on our table. Great job! Perfect view of the fireworks! Our final day spent in Palm Beach was another perfect day. We started by walking the Lake Trail which is a long bike path running up the intercostal waterway all the way to the Palm Beach Inlet. This paved bike trail is landscaped with many trees, some quite old and picturesque. Historical markers show you the original church in Palm Beach (now a home) and the oldest house in Palm Beach (Duck’s Nest). The Lake Trail is 6 miles long and to be direct it was really hot and humid Sunday… so we found an appropriate “turn around” spot and made our way back home to the pool! For our last night in Palm Beach we decided to eat at the Meat Market. Which was a restaurant we had seen all weekend and were interested in trying. The Meat Market is not your typical stuffy steakhouse. This restaurant has a very up-tempo vibe to the dining room, matched only by the great service. During this meal I was able to snap a more pictures than I had all weekend. The food that night was amazing and our server (Samantha) was so much fun! We started with the “Mm Slider Duo” which featured Kobe burgers with bacon and gouda cheese (lawdy). In addition, we had “Roasted Escargot” with spicy chorizo butter. Next was the “Tuna Tartare” with ginger, soy, avocado smash and mango mole. Next up, Samantha recommended the “Whole Roasted Cauliflower” with lemon, parsley, capers, parmesan, evoo, and cauliflower purée. I am fairly certain Frank, Joy, and Debbie all got an entrée… but I was only interested in photographing my sinfully delicious 16 oz. Chicago Prime New York Strip Steak with a Wild Mushroom and Truffle Sauce! The NY Strip was amazing! Our wine choice was a bold and powerful Cabernet Sauvignon from Napa Valley. This deep red wine with hints of blackberry and chocolate paired nicely with the decadent steaks we were all feasting on! Thank you Samantha and Meat Market for a great last meal in Palm Beach! Finally back at the house we took one last dip in the pool before turning in and heading home the next day. Thank you Joy and Frank for the wonderful weekend in Palm Beach!! !